This unique multi for dogs has been formulated to ensure your dog receives all the essential micro-nutrients it needs for optimum health. It provides a wide range of vitamins and minerals including the antioxidant vitamins A, C and E as well as trace minerals such as zinc and selenium at levels unrivalled in many other pet formulas. Yeast, Cellulose, Silicon Dioxide, Stearic Acid, Beef Flavouring, Magnesium Stearate. 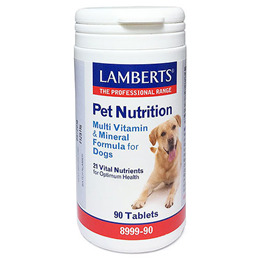 Below are reviews of LAMBERTS Multi Vitamin and Mineral for Dogs - 90 Tablets by bodykind customers. If you have tried this product we'd love to hear what you think so please leave a review.